★ Mziart Laundry Tote Bag is especially designed for the single person or maybe for students use, it is convinient, big, fashion and double side use as well. 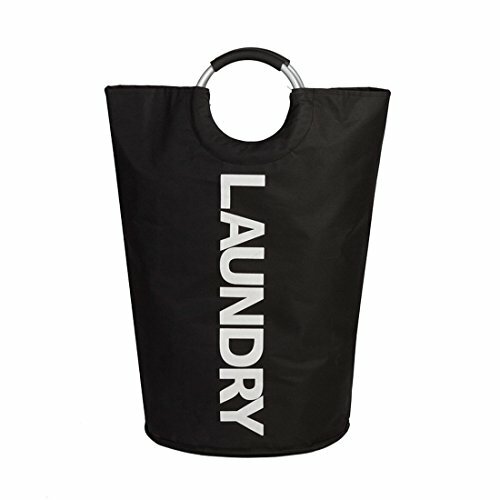 ★ A tote with double aluminum ring handles, You can take it to the laundry;meanwhile, there has a thick PE board in its bottom to keep it standing steady, you can put it in your home as a laundry hamper as well. ★ Dual side use 600D oxford fabric, thicken and sturdy. ★ Foldable design, store easily when needn't use. ★ Double sided, no show side seam stitching for optional reversible use. ★ Cleans easily inside and out with a damp cloth. Smell: This laundry bag is New from factory, it is simply new smell of the material packed in plastic. it's going to have a scent until the bag airs out. Warranty: please do not hesitate to contact us should you have any question or suggestion. We guarantee response within 24 hours and guarantee 100% customer satisfaction. What are you wating for? Click "Add to Cart" button and order your fashionable space saving laundry/tote bag today! Mziart strive to have the best customer service possible! If for any reasons you are unhappy with your purchase, please contact us. we will replace them or refund your money with no questions asked! We appreciate every customer and every order is important for us! Perfect for College dorms, Campers, Apartments, Hotel stay, Baby nurseries, Utility room and Shopping, college dorm room accessories. Self Standing Laundry basket, Hamper or Bin and yet you can tote your laundry around with one hand. Double-layered 600D Oxford fabric, thick PE board in the bottom for stability, the Alloy handles added foam. Bottom Dia.15" x H28" (including the handles with Dia.8"). Carry as a tote, or freestanding as a laundry hamper. Neatly folds to fit in limited storage spaces, luggage and travel storage compartments. View More In Pop-Up Laundry Hampers. If you have any questions about this product by Mziart, contact us by completing and submitting the form below. If you are looking for a specif part number, please include it with your message.